Rebel at Heart, is one of Thomas Sabo collections that I adored, its suitable for female as well. The subtle mix of materials and detailed signature characterize the unique aesthetics makes a real impact with its expressive messages. Each piece of jewelry is a symbol of experiences and dreams. 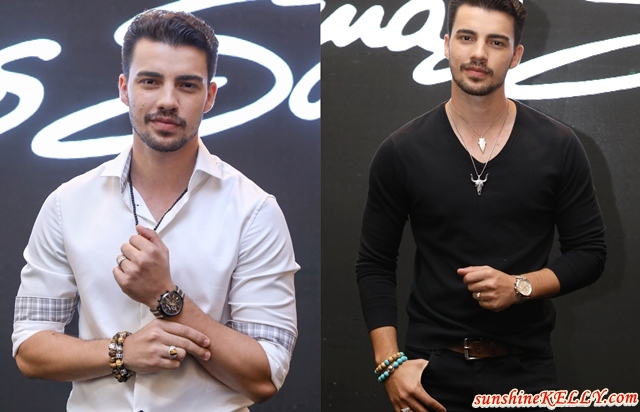 Recently we were at Thomas Sabo Spring Summer 2017 Rebel at Heart Collection Showcase in conjunction with their boutique in Pavilion Re-Opening. Let’s take a quick tour around Thomas Sabo Pavilion newly re-open boutique. Overall I love the impression for the moment I walk near the entrance. The front façade is wide and not too deep, thus make the boutique looks grand, spacious and welcoming. At one glance, I am able to get a better overview of all the jewelries on display. There is also a settee for those who need to take a rest and perfect spot for the boyfriend or husband to wait while their beloved is shopping. Spring / Summer 2017 heralds the arrival of warm, earthy tones and patterns and shapes of Africa into the THOMAS SABO design language. Ethnically-inspired design codes such as spearheads and plait patterns and the materials used create truly exciting light-dark contrasts. The THOMAS SABO Power Bracelets with XXL Beads crafted from tiger’s eye, jasper, obsidian or lapis lazuli for men and women are the impressive energizers of the collection. They become veritable statements with their striking designs and the iconic highlights. THOMAS SABO extends its Maori inspired series with the new Whale Fin design. It is a symbol for strength, healing powers and emotional development. Further iconic design codes like skull rings and pendants as well as a cross pendant enter the season with new Maori and graphic patterns. The iconic THOMAS SABO Bull Skull pendant now comes with graphic, culture inspired design elements and abstract settings of imitated turquoise stone inspired by the Wild West, in a bewildering combination of Dreamcatcher Meets Cowboy. With a Rock ‘n’ Roll attitude, feminine interpretations of the skull motif in the new Rebel Diamonds Collection mesmerize reinterpret the iconic THOMAS SABO skull designs in a minimalistic manner with filigree, faceted diamonds. I love larger eye-catching accessories. But knowing myself, I'll wear once or twice and then leave them aside. I like the pendants. This store looks grand and spacious. It was such an opportunity for them to open a shop for Malaysian. I am sure many people gonna love their collection. I like the designs ...very unique..but I got to ask...cause I read a few times...but I still read it as one of the collection is made out of tiger's eye...or was it just meant as inspired by tiger's eye?